This is the book the authors wish they had a decade ago as they started out to raise healthy and resilient adopted children – and stay sane in the process. You’ve completed the paperwork, waited and waited and then waited some more. Then, your adopted child is yours to parent. And you plan to parent them better than anyone has ever been parented before. You’ve trained for this, you’ve prepared for this. You are so ready! Before long, you realise that the hard work is just starting. You realise that you are dealing with a child who has experienced trauma, and that you need to partner them in healing. You face a world that treats you differently because you are an adoptive family. You start to feel isolated as people tell you “that’s just kids”. You feel like that just isn’t true. This is where Lionheart comes in. This book was written over two years, a collaboration between four adoptive parents with over a decade of intercountry adoption experience each. It honestly and humorously shares the authors’ issues, mistakes and triumphs – from the early days, the central issue of trauma, behavioural challenges, the therapy and strategy toolbox, and parental self-care. Lionheart chronicles years of trial and error and many (so many!) mistakes, and through shared struggles, successes and learnings will provide you comfort that you’re not alone. Lionheart is a for-purpose venture, with all proceeds from the book supporting a range of targeted projects benefiting vulnerable children in Liberia, Sierra Leone and Cambodia, under the banner of Big Love Family Projects. Visit lionheartfamilies.com for resources and project updates. Jodie Hampshire is the author and publisher of Lionheart. A mother of four, she has been an adoptive parent for over a decade. Her professional education was in finance, where she works full-time. Over the years, she's worked in Sydney and London for investment managers, she's been a stay-at-home mum, established a children's fashion line and been a Board director. With her research and logic-based training, she naturally assumed she would be able to figure out adoptive parenting without too many issues. She assumed that plenty of love and enough money could fix everything. She quickly learned how naïve she was. She has particular expertise in therapeutic parenting, post-traumatic stress disorder and older child adoption. Jodie had long murmured about writing a book on adoptive parenting. A bout with breast cancer left her with a renewed commitment to chase her dreams. She easily convinced her collaborators and dear friends to join her in creating the adoptive parenting guidebook they wish they had had ten years ago. Jodie writes with honesty, humour and pragmatism. She says that writing Lionheart has been the cheapest therapy she has ever had. Most of the book was written in ten minute snippets in bed on Sunday morning, on the bus or on a plane returning from a business trip. Her favourite parenting advice is to be unshockable, always. And this too shall pass. Both pearls of wisdom have been applied countless times to her adoptive parenting life. She expects they'll continue to be used with great regularity. Jodie lives with her family near the beach in Sydney. Beyond her family, she is obsessed with her cats, exercise, the ocean, Picnic bars and people with big dreams or big hearts, or even better, both. I purchased the Kindle version of this book and loved it so much that I purchased a hard copy to gift to a friend. I'm considering purchasing another hard copy to pass around to friends and family as they ask about certain aspects of our adoption journey and parenting. 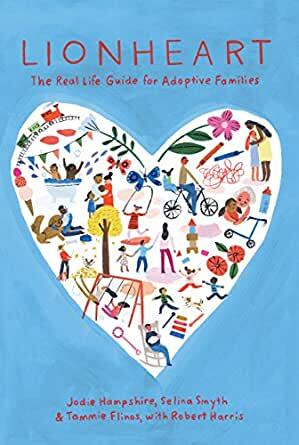 It was so refreshing to read something adoption-related that wasn't just a "how to navigate challenging situations/events" but also a genuine account of those challenges and how the authors reacted, even if it was a less than ideal reaction. I found myself relating to at least half of the challenges they covered after only two years of parenting one adopted child. If you or someone you know has adopted internationally and is in the first few years of parenting their child, it's a must read! Not only does it give practical ideas for dealing with the difficulties of parenting children with trauma, it's the most helpful book I've read in not making me feel alone in this journey. Thanks to the authors, I find that I have a more long-term perspective for parenting my child. 5.0 out of 5 starsThis book is a lifesaver! This book is a lifesaver! If you feel as though you are alone in your struggles or that you don't have the tools you need to help your child, this book provides both encouragement and practical answers. Trauma is an incredibly difficult thing for some people to comprehend, but the effects are real and wide-reaching. Even though my daughters were babies when they came home with me, the fact is that adoption is loss. It's hard and beautiful and exhausting and joyful--often all at the same time. These three women have opened up their lives and shared their experiences so families like mine don't have to feel alone, and can try new approaches or techniques to issues that come up, big and small. I'm so grateful for their generosity in sharing both the good and the bad, their successes and failures. I've already recommended this book to three friends, all of whom are in the thick of caring for a child who has experienced trauma. And each one has been so grateful to have this incredible resource. 5.0 out of 5 starsA must-have in an adoptive family's library: loved it! If I feel sorry about something with this book, it's not having read it one year ago. I love the honest accounts of these mothers. They truly confess to all the frustration that is rising an adopted child, but at the same time offer practical positive solutions to a wide range of issues one may encounter. Their experiences are very different so it's easy to find aspects that resonates. The book is well-written and full of humour. It got me laughing at several points and thinking "You mean I'm not the only one doing / feeling / having said that?!". I can assure you it's not easy to find honest accounts of daily life with adopted children. This is one of them and it's supporting me greatly. 5.0 out of 5 starsThis is a great reference book to keep handy. The advice provided is wonderful. The advice sets your mind on a thinking spree you had not considered. The advice seems common sense after you think about it. This book helped me relax knowing there are alternative tools to help. This book is exactly what I was looking for. I am in the early stages of thinking to adopt but wanting to know more... and more than just about home studies and picking an agency, but about parenting and long term imprints of adoption for parents and children. It's very practical, as it was written by seasoned adoptive parents, and isn't an overwhelming amount of information so you don't feel like your drowning or shouldn't be considering this path.